Not for real of course (unless you just won the lottery), but in the Monopoly board game! If you've ever played the original Dutch Monopoly game, you might have noticed that Eindhoven is missing. Smaller cities like Groningen, Haarlem and Arnhem are represented but for some reason the Dutch 'city of light' has been left out. This was also noticed by Remco Dalhuizen, a local entrepreneur who was born and bred in Eindhoven. He got in touch with Identity Games, the company behind Monopoly and its worldwide success. A new idea was born. 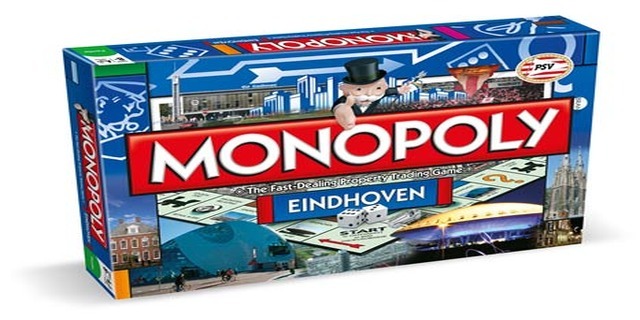 Some other cities, like Rotterdam and Arnhem, already have their own Monopoly game and together the initiators decided that an Eindhoven Monopoly game had to be the next one on the list. After all we've been awarded the best inner city of the Netherlands and world's smartest region, right? So what will this Eindhoven Monopoly look like? The game board will look exactly like the original Monopoly game with stations, 'free parking', 'go to jail' and 'chance' cards, but the streets are all existing Eindhoven streets and areas. You must know Markt, Stratumseind and Wilhelminaplein and also Philipsdorp and Strijp-S will be represented. Eindhoven companies and organizations got the chance to 'buy' the street or area where they're based in exchange for their logo on the board. A large part of the profit will go to a good cause: the Maxima Foundation, a cancer sufferers' support fund connected to the the Maxima Medical Centre (hospital) in Eindhoven. The Eindhoven Monopoly game will be available from August 30th. You will be able to find it in specialized board game shop Jolie Spellen and regular toyshops. For more information about Eindhoven Monopoly, you can check out Facebook page (in Dutch) or get in touch with us.